Izabella's Tattered Letters: Did I mention? Did I mention I love fast vehicles?!!! Love it, love it, love it!! 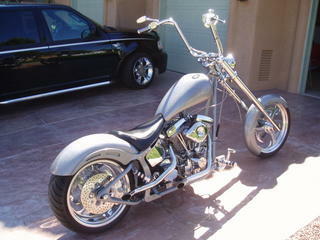 Here's a not so good picture of my 2003, 100 year edition, supercharged Harley Truck & a custom chopper, soooo loud. Hi there blog owner! I am searching blogs to find information and sources to help with my website:http://www.horse-lover-gift-ideas-central.com/collector_plate.html My site is fairly new about 8 months old and have a google pr of 3 and get about 50 people a day to visit. My site has clock collectible wall and is all affiliate merchandise. I have been in MLM companys for the past 8 years offline mainly and have never made a dime. This is a new frontier for my wife and I and don't have very much experience but a friend suggested searching blogs to get ideas about how people sale and also what kind of information they offer their customers and clients. We are begining to make some good money selling clock collectible wall related articles but I also want to offer my customers some quality information to go along with good deals. If you make it to my site and can offer some constructive critisizm I will take it into consideration or if you have some ideas it will be greatly appreciated. Remember we are on a budget and we do all the work ourselves.